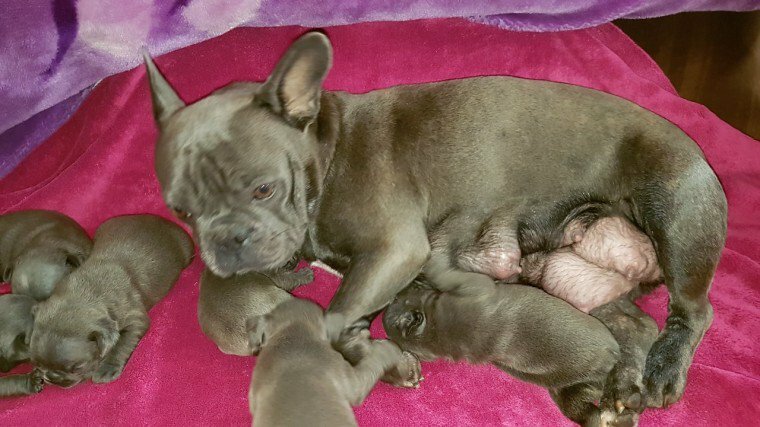 Amazing litter of 9 solid blue french bulldog puppies is now over 5 weeks old and can be seen with mum. They are sired by famous King of England. Puppies are Hc Clear as both parents health tested. both HC CLEAR. We Have 5 boys and 4 girls available. They will be KC REGISTERED with 5 Generation Pedegree. microchipped. defleated and dewormed and will be ready to leave from 16th October 2018 after their first vaccination. Boys with white on chest 2000. each Girls with white on chest 2300. each We also have 2 female puppies from previous litter who are now 11 weeks old and ready to leave now priced at 1800 . each. KC and Solid blue. Viewings are now available and deposit of 500. will secure puppy of your choice.